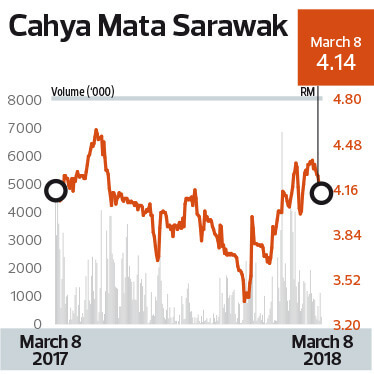 AS Cahya Mata Sarawak Bhd (CMS) prepared to release its full-year earnings last month, its share price began rising in anticipation. On Feb 23, it hit a nine-month high of RM4.37, up 9.52% over two weeks. That was the day it announced a 27.2% year-on-year increase in full-year net profit to RM215.23 million for the financial year ended Dec 31, 2017 (FY2017), as revenue improved 3.6% y-o-y to RM1.61 billion. The earnings recovery from FY2016, which saw net profit hit a four-year low, was driven by stronger performance by some core businesses and other strategic investments, the group said. Had it not been for some unforeseen financial hits — RM28 million in forex losses at OM Materials (Sarawak) Sdn Bhd and a RM12 million provision for the Penkuari quarry mitigation works — FY2017 would have been a record year for CMS, surpassing its RM248.1 million net profit in FY2015, an eight-year high. But despite the numbers and positive outlook, the stock has been falling since then. Last Thursday, it closed at RM4.14 per share, retreating 5.26% since Feb 23. Over the past year, the stock has fallen 0.3%. Several analysts The Edge spoke to opine that the market is disappointed with the continued losses at OM Materials, which missed earlier expectations of a maiden profit in FY2017. Overall market sentiment may have also been a factor, they say. The move by the US to impose tariffs on steel may also have sparked worries of a possible impact on OM Materials, one analyst says. The benchmark FBM KLCI started falling from a high of 1,871.46 on Feb 27 to as low as 1,837.90 last Wednesday — a 1.79% contraction in just over a week. Losses at OM Materials were a major drag in FY2016 as the ringgit’s collapse as well as a weakened ferrosilicon market took a toll. That year, CMS recorded RM35.17 million share of losses due to currency hedging losses. Currency hedging was a requirement in the smelting plant’s financing and required nine months to unwind, the group previously told The Edge. OM Materials majority shareholder, OM Holdings, is just as bullish. In a statement to The Edge, it says OM Materials enjoys one of the lowest production costs in the world, thanks to cheaper electricity in the Samalaju Industrial Park (SIP). “Consequently, OM Materials is shaping up to be an alternative source of ferroalloys for Asia’s steel producers that have historically relied on exports from China, which have closed down many of its ferroalloy smelters,” it adds. For 2017, the smelting plant contributed A$25.4 million to its overall net profit of about A$92 million. OM Holdings says it expects to sustain the performance moving forward. “If circumstances are advantageous, we may consider a secondary listing on one of the Asian stock exchanges,” OM Holdings executive chairman Low Ngee Tong says in the statement. All six analysts tracking CMS have a “buy” call, with target prices ranging from RM4.62 to RM5.20. The latest upgrade was by UOB Kay Hian on March 6, which raised its target price by 90 sen, or 15%, to RM5.20. “We foresee an exciting year for CMS, led by the sharp turnaround at associate OM Materials and the roll out of the mega Pan Borneo Highway project,” says the research house. It notes that the company’s assumption of a RM50 million contribution to net profit from OM Materials in FY2018 is conservative as it is based on an average selling price (ASP) of US$1,200 per tonne compared with current market levels of US$1,600 to US$1,800 per tonne. It also expects the group’s investment in the upcoming phosphate additives plant to enhance shareholder value by 10%. “CMS’ FY2018 earnings could easily beat the consensus net profit target of RM272 million, given that FY2017’s core profit was already at RM262 million,” says UOB Kay Hian.